This book sat on my Kindle for a long time… not sure why it took me so long to pick it up, but once I did I couldn’t put it down. Seriously. I started reading it at 11:30 pm (big mistake BTW) and the next thing I knew it was 3:30 am. *sigh*I really should have known better. My love of contemporary romance is hit or miss. 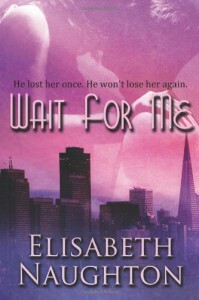 Yet, when it comes to Elisabeth Naughton, there’s no question about whether I’m going to get sucked in or not. Stolen Fury, the first book in her Stolen Trilogy should have confirmed that. Besides that, I have a huge addiction to the Argonauts in her Eternal Guardians series. Basically, whatever Naughton writes, I need to set aside a good chunk of time because there will be no stopping until I’m done. Period. Ok, now that we’ve gotten past my lack of late night reading judgement, let’s get down to Kate and Ryan.Usually when I read a romance there is one character in the couple that I sympathize with more than the other. That was impossible in Wait for Me. Both Kate and Ryan’s lives had been torn apart in so many ways that it was impossible to get upset with either one of them for the reactions that they had. Ryan was still in love with a ghost and Kate’s entire existence, as she remembered it, was a lie. This had to be one of the more heart wrenching romances that I’ve read in a long time. Their reactions to the situations were human and totally believable. The supporting characters weren’t just filler, they were important pieces to the overall story. I fell in love with them all.This story also had it all. There was romance, suspense, humor, mystery and a surprising twist that totally caught me off guard. Honestly, I didn’t pick up on who the real bad guy was until I was supposed to. That doesn’t happen very often and I loved it.One of the other things I liked about this book was the portrayal of the kids. No, Julia did not come off as a normal 9-year-old. What exactly is normal anyway? I loved that she was snarky and smart. She was witty and above everything else she was determined to protect her dad. Given the way she had been raised and the adults she was surrounded by, it stands to reason that she would have the personality that she had. Reed was also written well. I know it seems minor in the scheme of things but I really like it when kids aren’t ‘written down.’ Julia had her typical 9-year-old moments and they were as believable as her ‘adult’ ones. They all made her as important a character as the adults and given the subject, that was important.So, yeah. I really enjoyed this story. It came to a satisfying conclusion with hope. Nothing was easy. Their lives weren’t all wrapped up in a pretty bow with all their problems solved at the end but it was believable and stayed true to who the characters had become by the end of the story.